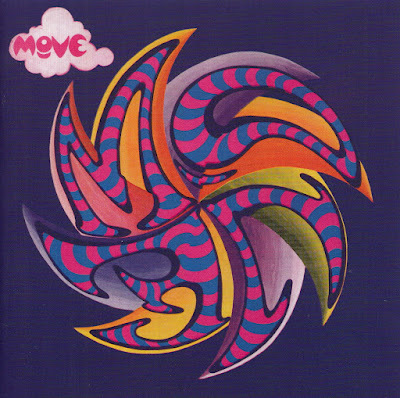 At last, The Move’s eponymous debut album gets super deluxe treatment in this definitive reissue from Esoteric Recordings, UK. This three CD, 65 track, 2 hour, 45 minute collection, with its 52 bonus tracks nearly doubles the 34 tunes contained on Salvo Record’s two CD, 90 minute, 2007 reissue of “Move.” Add to that, the incredible sound and other amenities and you have the makings for an absolutely essential collection! “Move” opens with the April, 1968, Regal Zonophone LP’s thirteen tracks supplemented by thirteen bonus tracks, for a run time of 69 minutes, with everything presented in glorious mono. From the opening notes of “Yellow Rainbow” the listener knows he is in for a real treat. As for the album’s tracks I find the band’s cover of Moby Grape’s “Hey Grandma” to not only match the original, but to perhaps be the best performance on “Move.” Other highlights include “Walk Upon The Water” with “Ace” Kefford’s bass pushing Bev Bevan’s drums into overdrive, and gorgeous vocals by Carl Wayne and album closer, “Cherry Blossom Clinic” with its pile driving beat led by Wood’s guitar. The bonus material begins with three tracks from 1966, two previously unreleased and “You’re The One I Need” with Roy Wood’s guitar howling! Next up are five tracks from Birmingham radio stations, also from 1966, and showcasing Wood’s guitar and Wayne’s vocals. The rhythm section of “Ace” Kefford on bass and Bev Bevan on drums are tight throughout. Next up are two singles, “I Can Hear The Grass Grow” and “Night Of Fear” along with their b-sides. Two tracks tailor made for 45″ release if ever I’ve heard them. The singles did well in the UK, but did not garner the band attention in the US. The disc closes with “Vote For Me” recorded in 1967 but going unreleased at the time. The second disc of the set is dedicated to stereo mixes, 20 in all, 51 minutes of absolutely incredible rock and roll, beginning with “Night Of Fear” and including some tracks not available in mono, such as “Move Intro” with its harmonious vocal intro, followed by Bevan’s machine gun drumming and Kefford’s thundering bass introducing “Move” with its incredibly tasty, snarling guitar solo courtesy of Wood. The band’s vocal harmonies are on display on “Yellow Rainbow” and “Kilroy Was Here” both of which were included on the LP. Both songs were great candidates for single release, but neither of which saw release on 45. The snappy “(Here We Go Round) The Lemon Tree,” a great piece of pop rock in its own right follows, complete with Left Banke style strings. All the album’s tracks besides “Hey Grandma” are presented in stereo here, and in true stereo, with the exception of “Yellow Rainbow” which is found in an enhanced stereo version. The disc is rounded out by alternate takes of “Vote Fore Me,” “Night Of Fear” an un-dubbed version of “Disturbance” and an early piano version of “Fire Brigade.” The quality of material on display here is consistent, always interesting and always well performed. The third disc contains the 19 tracks, 47 minutes, including two interviews with Carl Wayne, recorded in five sessions for the BBC between January, 1967 and January, 1968 and includes many songs never otherwise released as well as fresh takes on tunes from the LP. The disc opens with the straight ahead rocker “You Better Believe It Baby.” Among the many standout tracks is the band’s take on “Morning Dew” with Roy Wood contributing wah wah and fuzzed out guitar. The band’s version was obviously influenced by Tim Rose but rocks much harder. Also, there is a wonderful cover of Love’s “Stephanie Knows Who” with Wood’s guitar and Wayne’s vocals carrying the tune. Wood’s solo is especially interesting and Wayne’s vocals are true to those of Arthur Lee on the song’s original recording. The band gives a fine performance on “It’ll Be Me” with its harmonies and insistent groove and features another memorable solo and more snarling guitar by Wood. The disc closes with recordings of two tracks from the LP, “Walk Upon The Water” and “Useless Information” both holding true, and equal, to their album counterparts. Mark Powell, assisted by his wife Vicky, did a wonderful job compiling “Move” for Esoteric Recordings, with five unreleased tracks, including three from the studio, making their way onto the collection. The 24-bit remastering by Ben Wiseman at Broadlake Studios is outstanding, making The Move sound better than ever. The set includes a poster of the album’s artwork with news clippings and photos on the reverse side. There is also a full color, 20 page booklet with complete track listings, an essay by Mark Paytress and many wonderful photographs. Okay, so this isn’t the first time I’ve bought these albums and EP (“Something Else”), not by a long shot. I thought the Salvo Records releases from 2007 and 2008, including a four CD box set with 31 of its 62 tracks being unreleased, would be the end of my Move purchases. But, Esoteric has done an incredible job for fans of mod pop and psychedelic rock with this three disc set. I think I can say with some certainty that this will indeed be the definitive “Move” at least for the foreseeable future. Pick up a copy of it as well as the other three Esoteric Move reissues, to be reviewed here soon, put a disc in the player and travel back in time to the mid 1960s when bands like The Move filled the UK air waves and were treasured by hip mod music fans in the US and elsewhere. Roy Wood may never have ingested psychedelic drugs but he certainly could write and play some of the most interesting music of the day with The Move. “Move” is proof positive of that!